Presentation binder clips deliver superior holding power to keep files organized and secure. Handle can be removed for permanent binding or folded flat for storage. You can also use the handle upright for handling or hanging. 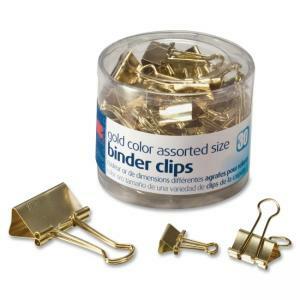 Metallic-colored binder clips come in assorted sizes including 6 medium, 12 small and 12 mini clips. Binder clips come in a reusable plastic tub for storage and easy access.